When I give my “Escape to Paradise” lecture on board ship, people always want to know how Panama got on my short list of countries when we were looking for a place to retire. So here’s the abbreviated story . 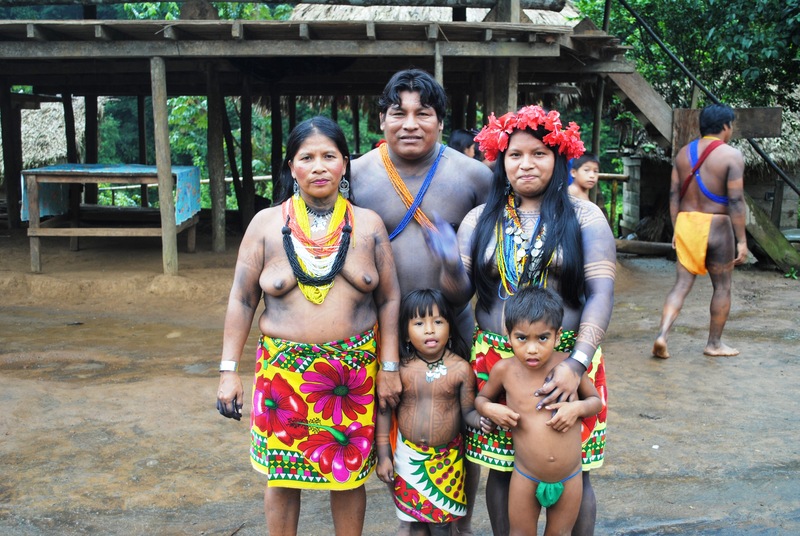 . .
My wife saw this “Authentic Embera Indian Village Tour” and wanted to go. It was expensive and I said, “It will just be some hokey, touristy thing” – not that Holland America would ever do a “hokey, touristy” tour, but we had been on some othercruise lines that did offer some “hokey, touristy” tours. So I told her, “You go, I just want to go ashore and say I’ve been in Panama.” So I paid $30 to get off the boat and go ashore to the “Gatun Lake Yacht Club.” Talk about a misnomer! There was . . . and is . . . absolutely nothing at the “Gatun Lake Yacht Club”. No yachts, no canoes, nada, nothing. There were a few Embera Indians there selling baskets and somehow I got in a “conversation” with one of the Embera guys. Interesting since I didn’t know Spanish and he didn’t know English. But somehow we began to communicate. Perhaps because paying $30 just to get off the ship was kinda “hokey, touristy”, the shore excursion operator began serving free beer to ROTTERDAM guests. So I got some beer, and brought some back to my new Embera Indian friend. Soon I met all his brothers, and soon I was getting beer for everyone. Pretty soon the shore excursion operator began serving the beer to me and my new friends. So here we all are drinking beer with the ROTTERDAM in the background . 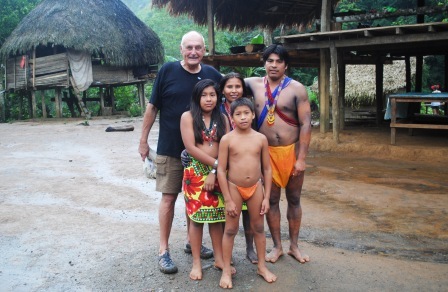 . .
Well it turned out that my new friend, Erito, was the chief of this particular Embera Puru village. His younger brother, Auselio, was in love and wanted me to take a picture of him and his girl friend. And I had to explain that in America we try to get the t-shirt off ! Well, they got my t-shirt, my 24 Hour Fitness gym bag, and they would have gotten my shorts, but I figured if the Chaplain came back on the ROTTERDAM wearing nothing but a red loin cloth, I’d never get invited back on Holland America! 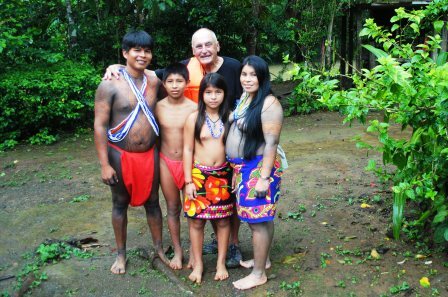 When I went back to Ventura I went on line to try and find out more about the Embera and their village and in the process, by accident, I stumbled onto all the information about retiring in Panama and the benefits of retiring in Panama. So that’s how Panama made the list! It’s because of Erito and his brothers that we live in Panama today! And we’ve remained good friends with Erito and all the folks at the Embera Puru village at San Juan de Pequini. We’ve visited them and they have visited us. And last year on ISLAND PRINCESS  I took 109 people on the ship’s Authentic Embera Village Tour to Embera Puru and took these pictures of the guys and their families. 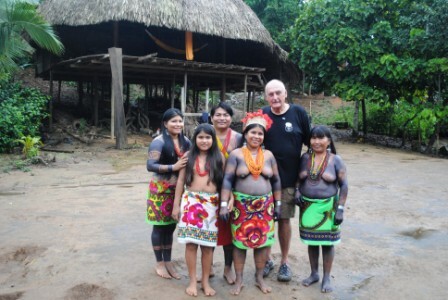 This entry was posted in living in Panama and tagged Authentic Embera Village Tour, Chagres National Park, Embera, Embera Puru, Embera tour, Escape to Panama, Escape To Paradise Living & Retiring In Panama, Expat Living, Holland America Line, International Living, Island Princess, living in Panama, Panama, Princess Cruises, Retiring In Panama, Richard Detrich, Rio San Juan de Pequini, Rotterdam, why Panama, Zuiderdam by Richard Detrich. Bookmark the permalink.